My heart is filled will gratitude and love. Since I told friends of Itch to Stitch and the sewing community about my recent house burglary, I have been the receiving outpouring support and love. It gives me hope that wonderful and compassionate people in the world way outnumbers the few bad apples that cause harm. I feel so fortunately to be a member of this incredible sewing community. My sewing friends, you never hesitate to lend a helping hand to others who need it. For that, I am extremely grateful. 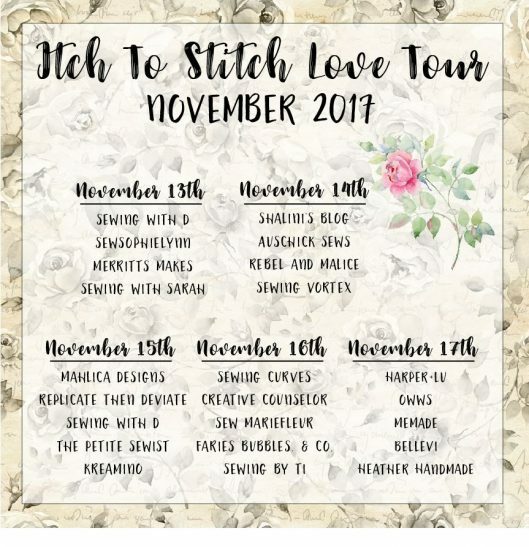 As a result of my incident, a group of talented sewing friends also put together the Itch to Stitch Love Tour. They are celebrating Itch to Stitch, but I’d like to think that they are celebrating love. It’s not just about patterns; it’s about love. I totally feel that love. Please go check out their amazing interpretations of Itch to Stitch patterns. I am on the edge of my seat waiting for the new posts to come online. And of course there are prizes. I sincerely thank all the sponsors for their contribution. Please participate and spread the words! It’s amazing what sewing community can do!! Such a wonderful bunch of people to help out. Such a supportive community. What wonderful groups. I’m so proud of the sewing community in their coming together to so such a wonderful deed! The sewing community is amazing! So sorry you were robbed, Kennis. I’m sending positive thoughts your way. I love this story! It warms my heart to see everyone pull together like they have! Isn’t it great what people can do when they work together. Love your patterns. Hope you make plenty more. Looking forward to checking out all of these blogs, especially several new to me! It’s amazing what a caring people can do. What a lovely group and thank you very much for your generosity. So true. How fortunate that we are in it! Sewists are the nicest people. What a beautiful reminder of the gift we have in this community. Can’t agree with you more. Hi Mel. Thank you! I am flattered. Please share your IG handle here so others can go visit you! What an amazing group of talented bloggers- proud to be a part of this caring sewing community! It IS all about the love, Kennis! The love you put into your designs and your sewing community are coming full circle back to you! That’s also how positivity and compassion work, isn’t it? Full circle.